If you worked or a re a customer of Monsanto, you have been impacted by this breach. The company has confessed that somebody was able to breach its system security, and gain access to computers that enclosed very sensitive details – which include customer names, addresses, tax ID numbers, and (in some cases) financial information. In addition, Monsanto’s human resources division had also been keeping private information on the compromised servers, including tax forms that comprised of employee names, addresses, and Social Security numbers and (“for a small number of employees”) driver’s license numbers. 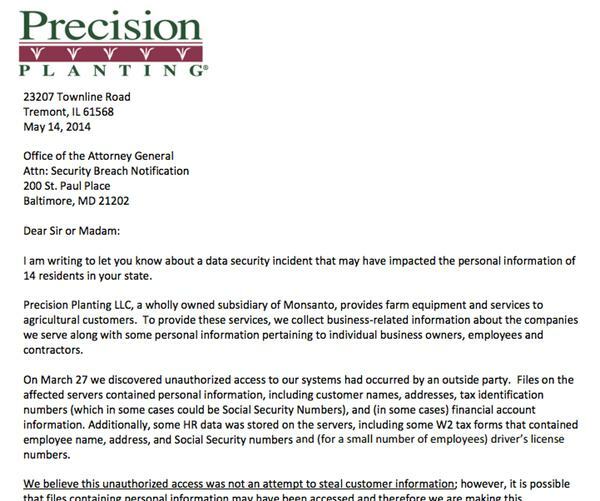 1300 clients and staff are believed to have been impacted by the hack, but in a letter to Maryland’s Attorney General from Monsanto’s Precision Planting division the organization states that it doesn’t think that the attackers were looking to steal customer details. You can view the statement sent out to all those impacted by the breach below.